Kitchen and water - not a problem. The EVOline® BackFlip is the safe electrification solution for representative kitchens, reception counters and presentation furniture. A light touch turns the insert of the built-in solution upwards and reveals two sockets and a USB Charger. The EVOline® BackFlip was awarded the Good Design Award 2015 and the iF DESIGN AWARD 2015 and is German Design Award Nominee 2016. When closed, spilled liquids flow past the housing. When opened, the terminals are slightly raised from the surface, preventing liquids from reaching the electrical contacts. Simply Safe. With a total installation depth of only 53 millimetres, the BackFlip can be easily installed over drawers or built-in appliances. Black or white glass, or steel surface: With the matching surface for the respective room design, the BackFlip fits where it is most useful to you. 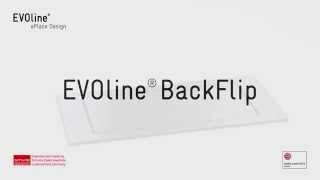 The EVOline® BackFlip is very easy to install due to its proven quick assembly. Snap in the mounting plate and you're done.